SALT LAKE CITY. Welcome to Salt Lake City! Your Tour Director is on hand late this afternoon to answer any questions. SALT LAKE CITY–JACKSON. Salt Lake City is the center of the Mormon religion, where Brigham Young declared to his followers, “This is the place.” Our orientation tour will show you the best of the vibrant capital of Utah, including Temple Square with its impressive six-spired temple and adjacent tabernacle. Continue north to the Wild West town of Jackson with its wooden sidewalks and swing-door saloons. Free time to explore the shops and museums of historic downtown. JACKSON–WEST YELLOWSTONE. This morning, make your way into America’s first national park, YELLOWSTONE NATIONAL PARK. Spend the next two nights in West Yellowstone, the west entrance and gateway community to the national park. WEST YELLOWSTONE. DAY EXCURSION TO YELLOWSTONE NATIONAL PARK. Today, you will see the Grand Canyon of Yellowstone with its Upper and Lower Falls. Watch for herds of bison, and view many of Yellowstone’s geothermal sites, including Old Faithful Geyser. HELENA–MISSOULA–KALISPELL. Today, we make our way to Missoula, a major lumber center and home of the U.S. Forest Service and the Smokejumpers’ training center. Visit the SMOKEJUMPER Visitor Center for an in-depth guided tour of the jump base and working facility of the smokejumpers. Learn about the jump gear, parachutes, cargo and aircraft used by the brave men and women in this demanding occupation. Stop by the VISITOR CENTER at the 18,450-acre National Bison Range, and watch for bison, elk, antelope, and mountain sheep. Continue along the shores of Flathead Lake, lined with cherry orchards and one of America’s largest freshwater lakes. KALISPELL–GLACIER NATIONAL PARK–GOING-TO-THE-SUN ROAD–KALISPELL. Upon entering GLACIER NATIONAL PARK, board the famous vintage RED JAMMER BUSES that will take you along one of North America’s most spectacular highways: Going-to-the-Sun Road. After crossing 6,664-foot-high Logan Pass, enter a geographical wonderland of alpine scenery, where jagged peaks, deep-green forests, pristine lakes, and meadows dominate the landscape. 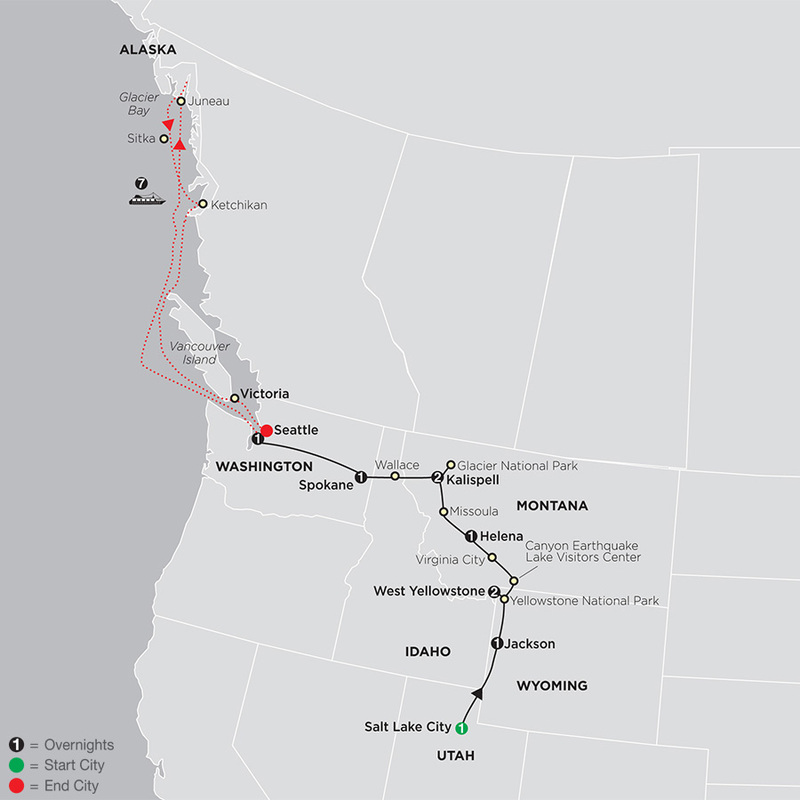 KALISPELL–WALLACE–SPOKANE. This morning visit Wallace, Idaho and tour the SIERRA SILVER MINE, where you travel underground with an experienced miner and learn the history of mining in this region. There’s time to explore this small historic city before continuing to Spokane, Washington, for the night. SPOKANE–SEATTLE. This morning, we make our way to Seattle, the “Emerald City.” This afternoon’s sightseeing includes the Seattle Center, site of the 1962 World Fair and the 605-foot-high Space Needle, and a stop at the colorful Pike Place Market. SEATTLE (DISEMBARKATION). Your cruise ends this morning. Please schedule flights after Noon. "The Western United States' national parks have some of the most spectacular scenery on the planet, and provide experiences and memories that last a lifetime. Where else can you see wild animals roam free among natural wonders and stunning canyons? It's my great honor to introduce travelers to these beautiful places as I tell the little-known facts and stories that bring each destination to life."